When I wrote Chick Bloodhound, it was for someone else. While many of my own ideas and obsessions are contained in the film, the movie is Paul Fraser through and through. It is both a testament to the auteur theory as well as the collaborative nature of filmmaking. Paul and I worked well together most of the time. He told me once his difficulty in collaborating with others is that most people cannot deal with his personality, which is both weirdly transgressive and white-picket-fence conservative. His suggestions are often wild and off-base; his ideas are sometimes half-baked, if warm at all; his taste in film runs from the difficult through the bizarre to the obscure. He loves the films of Ed Wood because they are terrible, and adores a movie like Rudy because it’s so fake. He professes an admiration for Tim Eyman, a controversial conservative political figure in Seattle, a point of some friendly contention between us. Paul’s favorite directors are Stanley Kubrick and David Lynch. There are both influences in the film. (The first gorilla shot is 100% Kubrick, the gorilla-as-monolith, a bit of satire, parody and homage at the same time.) But neither of these directors is very important to me, though I do not deny the importance or mastery of either. My tastes tend more toward Cassavetes, Jarmusch, and Jost. None of these differences created any difficulty between Paul and me. There were tensions at times, especially over the ending, but there was never any ill feeling or malice between us. This calm collaboration was possible because we each respected the other’s role in the process: Paul was the director, the auteur in charge, and I was the writer, given the honor of giving his vision to literary life. This relationship was not always stable. Once actors were added to the mix, the balance was thrown off. Many of the performers wanted to contribute dialogue, apparently not content to be on screen and acting. Paul sought to please everyone, hoping that the story would not suffer. I thought it best to avoid the set, or else I might end up punching an actor. Through numerous phone calls I fought for the integrity of the story, maintaining that certain scenes and words were key to the discovery of Chick’s central mystery. The biggest disagreement was over the ending. 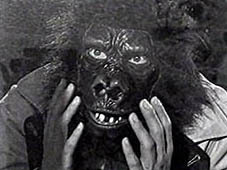 My original ending had Chick sneaking up on the Gorilla as the latter, sans mask, washed his face in the bathroom. When the Gorilla turns around, the face is revealed to be Chick’s own. Cut to black. In retrospect, my version seems arty and pretentious. I intended it to reveal that Chick has all along been fighting his nature, his inner beast. I’m not sure now if the previous scenes and words honestly led to that conclusion. The ending as filmed provides a different revelation, and also reveals that Chick has been involved in an internal struggle. But his struggle is not with his inner beast (if he has one) but rather his inner shlemiel. 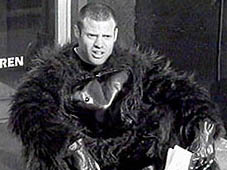 In an ultimate pathetic irony he dons the gorilla suit to impress Maria, only to have her reject him. For the most part, I enjoyed collaborating to make chick Bloodhound. It was an experience that led to me seeking it out with other directors, and certainly was a large part of my decision to make my own movie.